On Monday, October 22nd, Betmar hosted the Florida Shuffleboard Association Championship Tournament. We didn’t have the 97 teams Stan wrote an article about but we did have 60 teams, 39 in the Men’s Division and 21 teams of women played. That represents the largest Florida Shuffleboard Association Tournament of this early season. Yes, I know that’s a 40% reduction and I know that Shuffleboard is especially down this season. The field was very competitive with many great teams in both divisions. 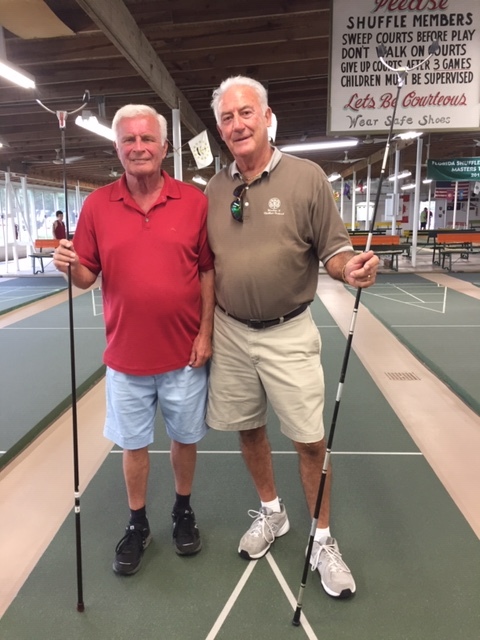 Henry Strong of the Zephyrhills Shuffleboard Club went over 600 points and was teamed with Earl Ball who won his 120th State Championship in this his 20th season. Many of the games were very close but Henry and Earl lost only one game in the Tournament. The Women’s Championship was played on the next court and was very exciting. Mary Eldrige, St Pete, and Arlene Guerrni, Clearwater, took on Joan Cook, Betmar’s 1000 Point Green Jacket Master, and Glenda Brake, ZSC. Joan and Glenda won the 1st game and the 2nd game came down to the last shot. Glenda, playing the foot put a high 8 in to give their team 75 the winning score, leaving Arlene with a tough decision, Arlene’s team had 70 points but were faced with Joan and Glenda having the next two hammers. Arlene swallowed hard, lined up the shot and shot the open board for the win; she made it just avoiding the centerline and the 7/8 line for the victory. Game three was just as close. Joan kitchened Mary late in the game to give her and Glenda a chance. 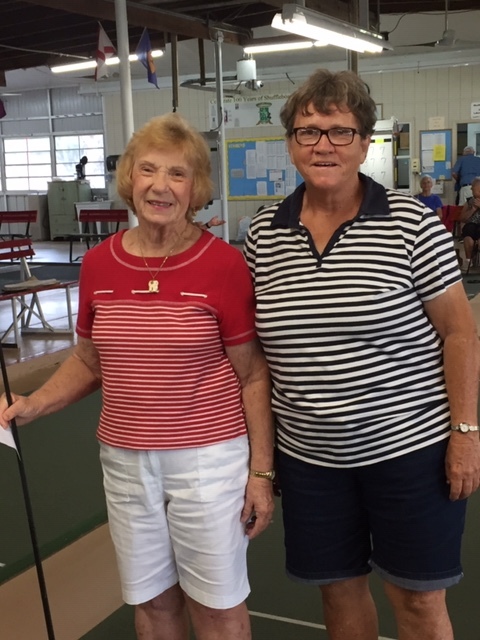 The score was 68 for Mary and Arlene and 67 for Glenda and Joan when Arlene shot her last shot and it stopped in the 8 giving Glenda a chance to score the winning block by taking the 8 off and holding for victory but it didn’t happen; Glenda rolled on to the centerline. Mary held Joan in check and stood all alone with a chance to win with her hammer. Can you think of anyone else you would want to take this shot for the Championship? Cool as a cucumber the legend put the hammer in the middle of the 8 for victory.